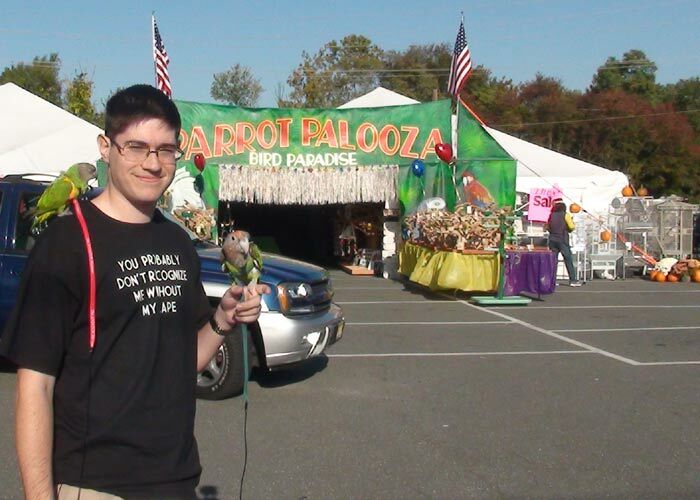 Someone on The Parrot Forum notified me about the Parrot Palooza this year in Burlington, NJ. So I decided to give it a shot and bring the parrots along. I take every possible opportunity to socialize my parrots to situations and people. I thought this would be a great chance for them to have positive experiences with other people since these would be actual parrot owners. I set out to the Palooza with several items on my shopping list. I heard there would be an incredible sale, so I was considering buying a large Java tree for the aviary, a travel cage for Truman, and a 25lb sack of Roudybush. However, I would only consider buying these if they were incredibly priced because I did not need them immediately. Truman spent the first hour of the drive screaming in his carrier. But finally he got a hint and shut up for a bit. Unfortunately there wasn't much left to go and he began screaming again as we got closer. I ignore him when he screams to avoid encouraging it even further. I think more outings and ignoring will be required to get him to sit as quietly in the car as Kili (or at least I hope). Kathleen and I went two days, Friday and Saturday. Friday was meet the speakers night and I was looking forward to meeting Irene Pepperberg. This was the real highlight of the event that made me decide to make the multi hour drive to visit. With Kili on my shoulder and Truman on my arm, I stood in a short line to get to meet the famous parrot researcher. I asked her about Corvid to Psittacine comparative psychology. She mentioned that she knows of research being done and a paper due in coming months. However, this did not strike up much of a conversation and she seemed impatient to get the brief encounter over with. So I just asked her to sign my copies of her books out to Kili & Truman. Knowing her background, I really shouldn't be surprised about Dr. Pepperberg's social manner. However, I had greater expectations from the endless intrigue I have acquired from her books. I did not even bother meeting the other speakers because I had no idea who they were. It kind of didn't make sense to meet them until I could hear their talks and learn what they're about. The rest of the Friday evening was pretty boring. There wasn't much going on and not that many people. Most of the people that were there were just shopping. So we looked around but weren't amazed by the products. Certainly they had an extensive selection but nothing out of the ordinary. The walls were lined with endless bird toys but it wasn't as much of a selection as you might think. Six hangars would be filled with the exact same toy which could span just a single one. So part of the impressive fullness of the shelves/hangars was really just redundancy. I received 10 raffle tickets for showing up. The system is somewhat complicated with an entire room full of stuff up for raffle. You have to put tickets with your name on them into buckets next to the items you want a chance at winning. Ideally I would have wanted the large Java tree for my aviary but I figured there was damn little chance of winning that with so many people bidding. So instead I put all my tickets on a parrot climbing net so that I might at least walk out with something. The rest of the Friday evening we spent in the lobby/lounge with the parrots. The store has a wonderful lounge for current or potential parrot owners to hang out with their parrots. 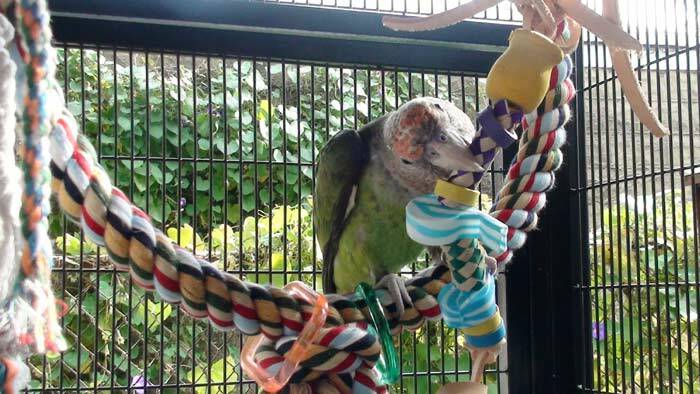 We got to meet friends from The Parrot Forum and do a little bit of training with Kili and Truman. They love showing off in front of strangers so it was not too difficult to get them to show a few tricks. I kept them in their harnesses because I did not want to risk them bothering other people more so than a fear of being unable to recover them in the store. 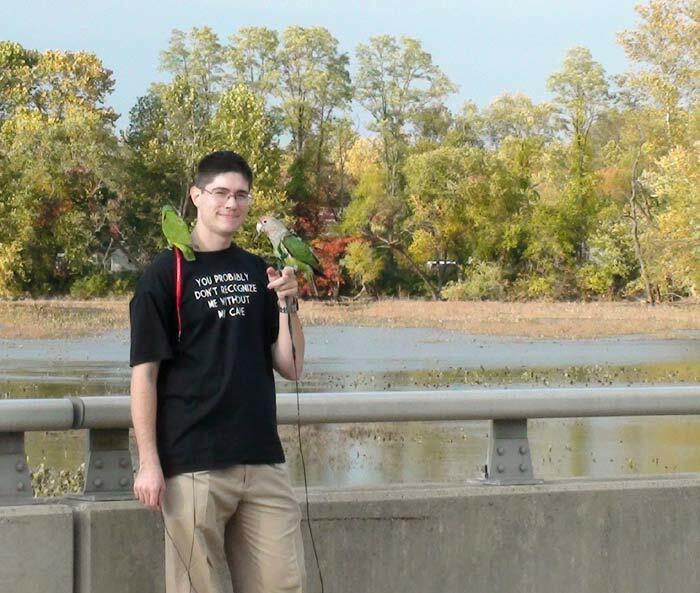 It is a good thing I brought the parrots along to keep me company or I would have gotten pretty bored otherwise. The following day turned out much better. We got there early and it was not yet crowded. We walked around a bit more but once again there was no temptation to buy anything. However, I needed to keep Turman busy and I had forgotten his toys in the car. So I bought a bunch of pacifiers (his absolute favorite toy) and plastic keys to keep him busy for a grand total of $3.50. That's all I spent at the Palooza but those items were worth it because I haven't seen them sold anywhere else. There seemed to be many contests and prizes going on but they were quite confusing because they were poorly explained or written about. I definitely found it difficult to find out what was going on. And it didn't help that half the employees weren't sure themselves. There were several ongoing contests with different colored tickets. There was a door prize raffle, another raffle for the parrot supplies previously mentioned, and then there was the penguin races. I didn't win anything or at least I had a hard time telling if I did or not. As I mentioned it wasn't very clear what the rules were or what was going on. The first event was the Birdman Exotic show. I can see how others might like it but I wasn't thrilled. The parrots he showcased were all clipped and doing elementary tricks. I can achieve much more advanced tricks with my parrot so it just wasn't interesting to watch. One trick was basically where he laid a parrot on its back on a spinning pedestal. I could just picture Kili snicker at this because she can do a forward flip and play dead. In another trick, the parrot merely picked up rings and put them on a peg. Kili sorts them by color. And she flies to get each piece. Once again, probably not a terrible show, but just not thrilling to me. 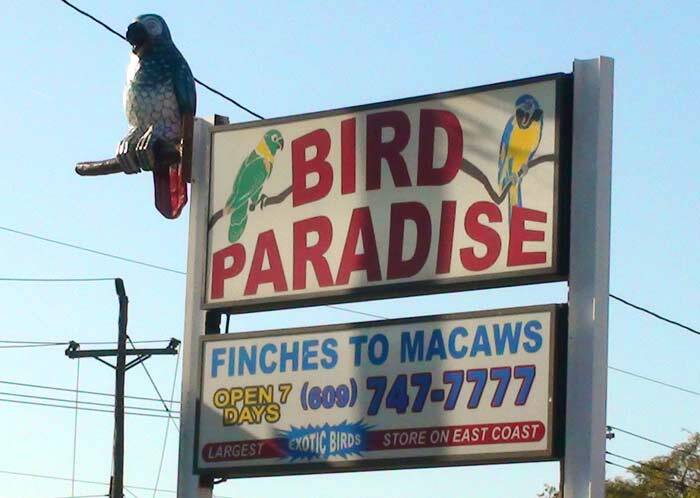 The first of the three speaker presentations was by the Bird Paradise store owner, Kathleen Lance. Her presentation was about what she had learned about parrots in her 30 year experience. The talk was about things like what kind of parrot to choose and what foods are good to feed. 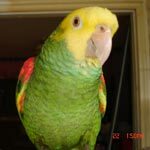 We have endless discussions about things like this on The Parrot Forum. Kili was acting up and screaming a lot so I had to walk out to put the parrots into their carriers in the car. I was surprised that it was Kili and not Truman being the trouble maker. They needed a break anyway so it was alright to put them away for a bit to eat and relax. When I returned, the next speaker was soon to present. I was excited to finally get to see Dr. Pepperberg speak. She talked about some of the basics of the Alex Studies and continued talking about their research about number perception in parrots. Most of this was not new to me because I had read both of her books and many of her papers. The only interesting part was toward the end about how they taught Alex the numbers seven and eight. That study was incomplete and did not end up in the books. A lot of people walked out on Pepperberg's speech and she even laughed that she understands her talk maybe too scientific for some. After the end of the second talk, Kathleen and I went to get the parrots back and enjoy free food. Kili and Truman also enjoyed pieces from my pretzel in return for performing some tricks. I always have my parrots perform some behavior even if I simply want to treat them. This helps maintain known behaviors and keeps interaction positive at all times. Not going to complain about free food. I think it was important to do that to keep people at the event. If people got hungry and left for food, they may not have come back. 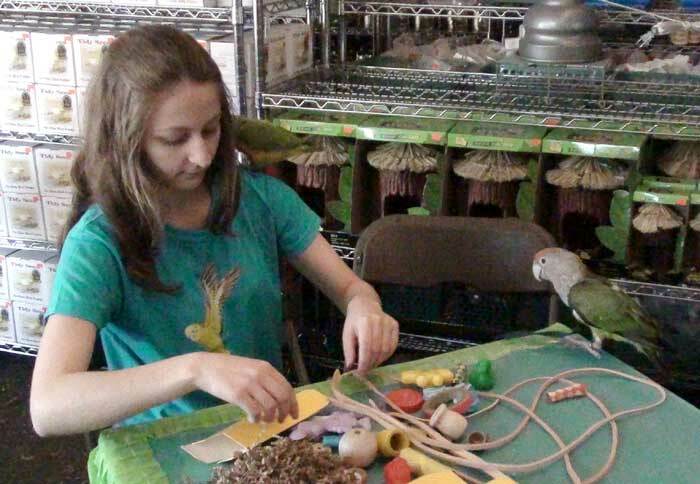 They set up large tables so it was an opportunity to meet and talk to other parrot lovers. 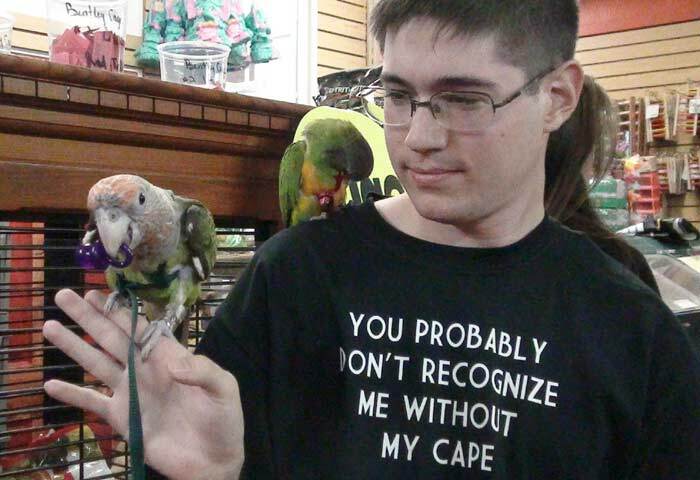 Interestingly, the most frequent question or fascination I received was about the parrot harnesses. Onlookers were surprised that I got them onto my parrots and asked how I did it. I explained that I used positive reinforcement training to undo the phobia created by using the method recommended in the DVD. Not only did I undo the damage, but I also made it so that Kili would put the harness on willingly by sticking her own head through. Unfortunately I saw many parrot owners that had brought their own parrots and were walking with them outside unrestrained. Although their parrots were clipped, even clipped parrots get carried away. While standing outside the bathroom waiting for Kathleen, a woman started asking me about taking food samples but I told her that I have no idea. Rudely, she sneered "well you should." She continued looking around and then began asking me again which ones are the pine nuts. I told her again that I don't know. She said "you should know cause you work here!" I was getting aggravated but instead I just played along and said, "YOU should know, YOU work here." She was surprised and replied "no I don't." Finally I said "well I don't either so I don't know." It wasn't the first time people assumed I was an employee but certainly the rudest. 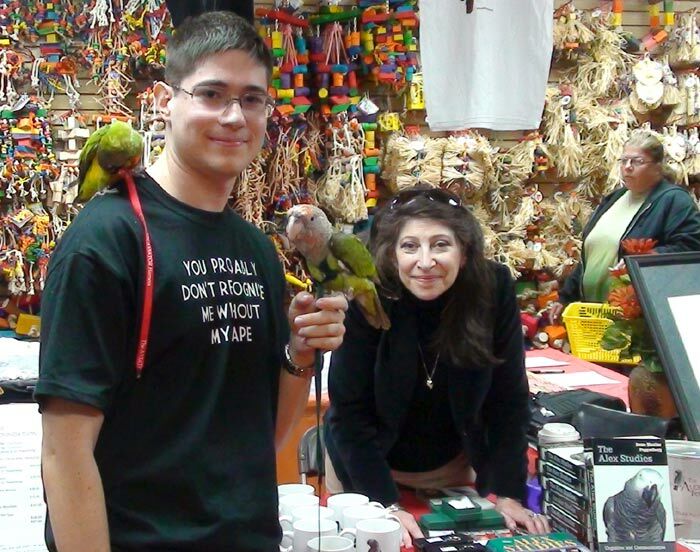 I think it's the fact that I was holding my parrots and just confident about bird handling that lead so many people to think I worked there. Just as we were preparing to leave, we discovered the parrot toy making workshop. Somehow we had missed that previously, probably because it was in a dark back area and poorly labeled. This was really cool and it's a good thing we didn't miss it. We gathered toy parts to the allowed maximum and then sat down to work on them. Kili and Truman helped by doing a quality control inspection of each part prior to us putting them on the toy. Just the materials that went into the toy alone cost more than I had spent at the whole event. I didn't mean to be a cheapskate but the things sold at the event just didn't appeal to me enough. We took the handmade toys and then set out on the long drive back home. In conclusion, I would suggest anyone within 2 hours drive to come take advantage of the event next time around. Certainly enjoy the free toys, food, games, raffles, contests, and speakers but stay clear of the shopping because it isn't really worth it.If you're just looking to have a fun time and can enjoy looking without buying, it's definitely worth coming if you have the time. Having just finished "Alex and Me" I've been pondering your encounters with Dr. Pepperberg. I gather that you found her a bit distant and thoroughly engaged with the audience. I think, quite honestly, she probably had mixed feelings about being there. She has to reach out to audiences like that to keep the Alex Foundation funded (and much to my surprise, even with the fairly remarkable results she had obtained, it seems academia is tolerating, rather than embracing, her research). But she, personally, doesn't approve of people who work outside the home keeping parrots as pets. She takes the view that they need intensive companionship throughout the day, which of course her lab subjects get. So it may tear her in two directions to be there. Plus she does have an ego, as many academics do (I can say this, being in that realm myself). She left a tenured position at University of Arizona because, basically, she didn't want to teach intro courses. She only wanted to teach in her specialty. I'd love to have dinner with her, but I'm not sure I'd want to try to interact with her as a "fan". Gee, I'm going to be in Boston for a week in two weeks and I have her email address... nah, never happen. Are cockatiels allowed to eat bread like Truman did in the vid? 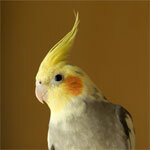 [quote="laducockatiel":14kjxyr9]Are cockatiels allowed to eat bread like Truman did in the vid? [/quote:14kjxyr9] Mine don't like fresh white bread. They wait for it to get crispy. The do it all kinds of brown bread when it is fresh. Michael - I just watched the video of your outing. Aren't you affraid of taking your kids in such a crowd? There are so many people and so many germs. Be sure to keep him on a harness cause it will be very active, many doorways, etc. 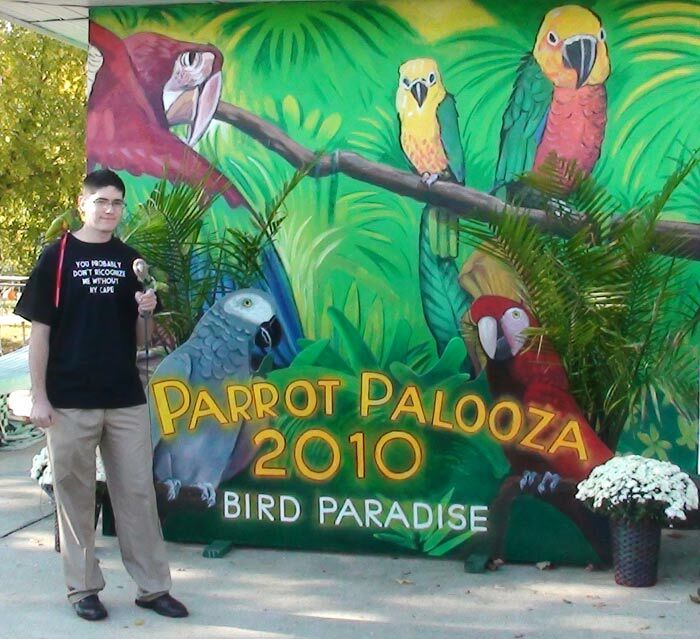 Michal, are you going to the paradise palooza 2011?